Leading brownfield regeneration specialists, St Pauls Developments, is bringing forward the next phase of employment land at the site of the former colliery at Dinnington, Rotherham, which is being transformed into a thriving business location. The company was formed in 1987 as the vehicle to acquire and reclaim the 72 hectare disused Cortonwood Colliery site in the Dearne Valley and is now based in offices at one of its own developments in Templeborough. The Homes and Communities Agency (HCA), the national housing and regeneration agency for England, which owned the Dinnington site, put the remaining land up for sale with CBRE in 2012 for commercial use under their property and regeneration programme. St Pauls has now released the first details of a 17 hectare site, previously known as Phase 2 development land and located off Todwick Road. It has been given the name "31 East" given its location close to junction 31 of the M1. Outline planning consent was granted in 2005 for B1 (excluding offices), B2 and B8 industrial uses and St Paul's believes that the site can accommodate a total 750,000 sq ft of logistics/warehousing space, with the capacity to develop a single stand-alone building of 450,000 sq ft. The site already has an access road and utilities and will benefit from the recently completed £14.7m improvement programme on the dual carriageway at the A57 between the development and the motorway. 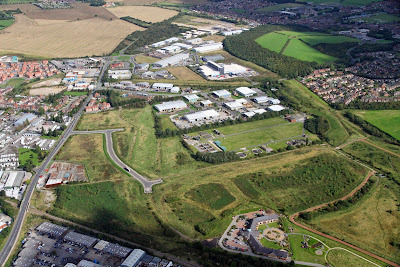 Earlier this year, sites in Dinnington were added to the expanded Sheffield City Region Enterprise Zone (EZ) that offers significant tax benefits to occupiers. The sinking of Dinnington Colliery began in 1902 and coal started to be raised in 1905. By 1911 the colliery was providing employment for 2,000 people. It closed in 1992 resulting in 1,000 job losses. Work began in 2000 on a £14m reclamation project from regional development agency, Yorkshire Forward with funds from the HCA's National Coalfields Programme. The 85 hectare site was eventually developed to provide areas for industrial, business and mixed use and large areas of Urban Green Space. The site reclamation won prestigious national environment awards for the way bioremediation was used to clean 30,000 cubic metres of contaminated soil. The Dinnington Business Park is home to Johnston Press, who invested £60m in a state of the art printing facility, alongside Macalloy, Assured Fire and Security and innovative security company, Connexion2. Local speculative developer EV Waddington also acquired a smaller parcel of land at Dinnington from the HCA and is bringing forward industrial units. The HCA estimated in 2012 that 620 jobs had been created so far and expected 2,408 jobs to be created as the scheme progresses.